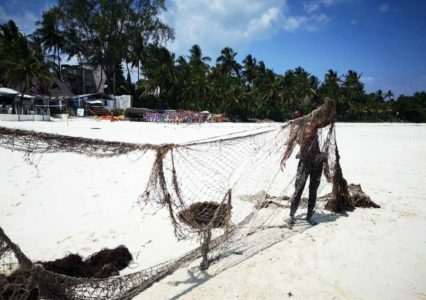 A large ghost net was removed from Jadini Reef in December 2018, estimated to be 5 metres deep. As the Olive Ridley Project starts its work in Kenya, we are eager to know what are the current ghost gear impact on local marine life. With a daily presence on the diving boats of Diving the Crab Dive Centre, one of our partners in Diani beach, our team is recording and, when possible, participating in removing all visible ghost gear on the local reef. In December 2018, we joined efforts with Diving the Crab staff members and concerned local residents Mandy Shackleton (Independent Marine Researcher), Nigel Turner and Denis Moserto, to remove a large gill net that was entangled in one of the reef area locally known as Jadini. The net is estimated to be over 100m long and 5m deep. It was tangled in an area of table coral. Since its discovery, our staff have routinely monitored the net to record any wildlife entanglements. After 45 minutes of intensive work, under challenging conditions, the team of 7 divers finally freed the coral from this deadly trap. The team also removed another smaller net on a different part of the reef. This net is estimated to be around 30 m long. Despite of all the cuts and bruises everyone got on their hands and legs from removing the large net from the sharp corals, the team couldn’t be more pleased with the work done. Both reefs have now been returned to their full splendour! Reporting and removing ghost gear from the Indian Ocean is one of ORPs main goals. The ghost gear problem was discussed during the Global Ghost Gear Initiative’s international workshop on Fishing Gear Management in Nairobi in November 2018. The workshop was led by the World Animal Protection, the Global Ghost Gear Initiative and the UK Department of Environment Food and Rural Affairs. Kenya representatives included Steve Trott and Michael Mwang’ombe from Watamu Marine Association, and Raphael Umundi from the World Animal Protection in Kenya. 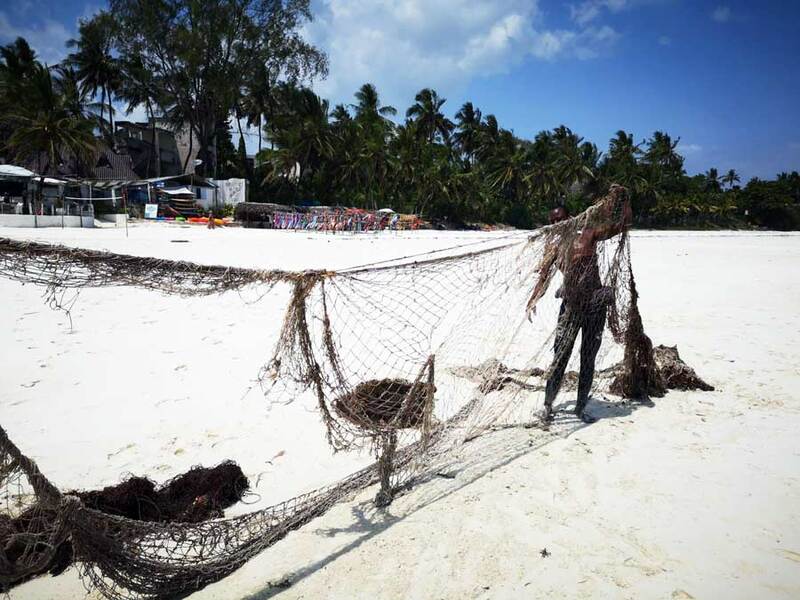 In Diani beach, fishermen may bring turtles caught accidentally in active or abandoned fishing gear to the Diani Turtle Watch team. In return, they receive a small compensation to cover any damage caused by the turtle to the fishing gear. However, it is possible that many cases of live and dead turtles caught in active or abandoned artisanal fishing gear are left unrecorded. The impact of industrial fisheries is therefore unclear. A publication from 2011 by the Coastal Oceans Research and Development in the Indian Ocean gives an account of the impressive variety of artisanal fishing gears in coastal Kenya. If you are interested, you can read the publication here: http://cordioea.net/storage/Samoilys2011-Kenya%20fishing%20gears.pdf. During first few days of January 2019, several apparently connected turtle strandings happened along a stretch of Diani beach. They appear to be fisheries induced mortality. 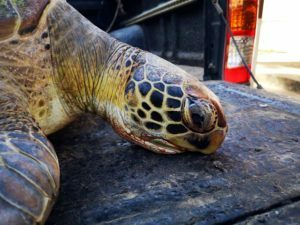 A total of 5 green turtles, none with any signs of external trauma and apparently healthy, and 3 other accounts of turtles found dead floating on the water, left the team puzzled. The causes of death remain a mystery. A necropsy that was carried out on one of the turtles, however it was inconclusive. The ORP team in Diani beach is committed to working closely with local artisanal fishermen in order to understand the impact of artisanal fisheries and ghost gear on marine life, particularly sea turtles.